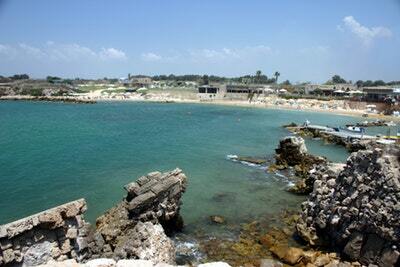 The harbor was built by Herod the Great (37-4 B.C.) and was one of the largest on the Mediterranean Sea. The southern breakwater that eventually turns to the north, was about 1650 feet [500 m.] long while the northern one extended westward about 590 feet [180 m.] long. The entrance to the harbor was from the north. For Josephus' description of the harbor see Wars. 1.408-413 [21.5-7] or Ant. 15.331-341 [9.6]. Extensive underwater archaeological excavations have taken place and have revealed the size of the harbor to be about 25 acres [10 ha.] - the outline of which is also visible from the air - and how it was constructed. Herod built the breakwaters by building wooden box frames, filling them with rubble followed by hydraulic concrete (using a special mix of volcanic ash from Italy). The apostle Paul landed at this harbor at the conclusion of his second missionary journey (Acts 18:22) and possibly at the end of his third as well (21:8). It is probable that his ship departed from this harbor as he set sail for Rome to be tried by Caesar (27:1).